The Hyper-V Bandwidth Meter v.3 for Windows Server 2016 is now available! We also continue to develop and support the Windows 2008/2012 version: Hyper-V Bandwidth Meter v.2. Please download the new version of Hyper-V Bandwidth Meter and read the user guide. This entry was posted in Bandwidth meters and tagged bandwidth, bandwidth monitor, hyper-v, Hyper-V Bandwidth Meter, traffic meter, traffic monitor, virtual machine bandwidth, Windows 2016 on December 23, 2016 by admin. A new parameter (LogPrefix) is added to the INI file of the Hyper-V Bandwidth Meter. It makes the data consolidation process easier. It is useful in case you copy log files from multiple Hyper-V servers to a single one, consolidate them and view the consolidated report. This entry was posted in Bandwidth meters and tagged hyper-v, Hyper-V Bandwidth Meter on April 21, 2016 by admin. The new version of the SQL Bandwidth Meter for MS SQL Server 2012 (and 2008, 2005) released. This entry was posted in Bandwidth meters, SQL software and tagged bandwidth, bandwidth meter, MS SQL, mssql, sql, sql bandwidth meter on June 20, 2013 by admin. The Hyper-V Bandwidth Meter for Windows Server 2012 (Microsoft Hyper-V Server 2012) is now available! We will continue to develop and support the Windows 2008 version too, of course. This entry was posted in Bandwidth meters and tagged bandwidth, hyper-v, Hyper-V Bandwidth Meter, traffic meter, Windows 2012 on March 18, 2013 by admin. The new version of the Hyper-V Bandwidth Meter has some performance related improvements. This entry was posted in Bandwidth meters and tagged bandwidth, hyper-v, Hyper-V Bandwidth Meter, traffic meter on March 4, 2013 by admin. The core engine of this software was re-created from scratch. Now it uses less RAM and CPU resources. Fixed: Small bug related to the long lasting connection calculations. Added: License key verification now can be local and via the Internet. This entry was posted in Bandwidth meters, SQL software and tagged bandwidth, bandwidth meter, MS SQL, mssql, sql, sql bandwidth meter on January 25, 2013 by admin. Now your customers (VPS users) can see Hyper-V bandwidth usage reports online. We created a free add-on for the Hyper-V Bandwidth Meter, we call it Web Parser. The Web Parser processes the bandwidth usage log files and shows the reports online. Below you can see a sample report. To look at the reports users need to enter a password, so they can see only their virtual machine bandwidth usage. But the Hyper-V server administrator (with the master password) can see all the stats at a time. Please download Web Parser and read Web Parser Guide to find out more. This entry was posted in Bandwidth meters and tagged bandwidth, hyper-v, Hyper-V Bandwidth Meter, traffic meter on January 22, 2013 by admin. 1. Backup Hyper-V Bandwidth Meter files. The default folder is C:\Program Files\BwHyperV\ Make a copy of this folder, just in case. 3. Download this file and unzip it. 4. Copy (and replace) all the files from that ZIP archive to Hyper-V Bandwidth Meter folder. 5. Start BwHyperV… Windows service. This entry was posted in Bandwidth meters and tagged bandwidth, hyper-v, Hyper-V Bandwidth Meter, traffic meter on October 25, 2012 by admin. Now there is an extended logging mode (or “Debug mode”). This mode can be turned on for one of the virtual machines at a time. The Hyper-V Bandwidth Meter will save the info about incoming/outgoing traffic from and to all the IP addresses, ports and MAC addresses. This is useful if you need to find more info about the traffic sources and/or if some virtual machine is under attack. Please download the new version of Hyper-V Bandwidth Meter. This entry was posted in Bandwidth meters and tagged bandwidth, hyper-v, Hyper-V Bandwidth Meter, traffic, traffic meter on October 25, 2012 by admin. SQL Bandwidth Meter 1.0.2 for MS SQL 2012 is now available. In 1.0.2 one minor “bug” was fixed. In some rare cases the results of monitoring of long lasting connections were incorrect. 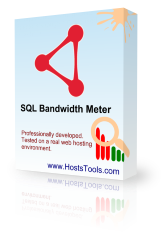 SQL Bandwidth Meter is a unique tool for SQL Server 2012 bandwidth usage monitoring, counting and reporting. What makes it unique? It provides a bandwidth control on per user basis. With this tool you can see the amount of data used (downloaded and uploaded) by each SQL Server user. Thus you can bill your customers for the SQL bandwidth usage or just find out which customers use your SQL server intensively. Installation is straightforward and only takes a minute by entering IP address of your SQL server and clicking several buttons. For more information, please read this document. This entry was posted in Bandwidth meters, SQL software and tagged bandwidth meter, MS SQL, sql, SQL Bandwidth Meter 2012, sql server, SQL traffic on September 28, 2012 by admin.